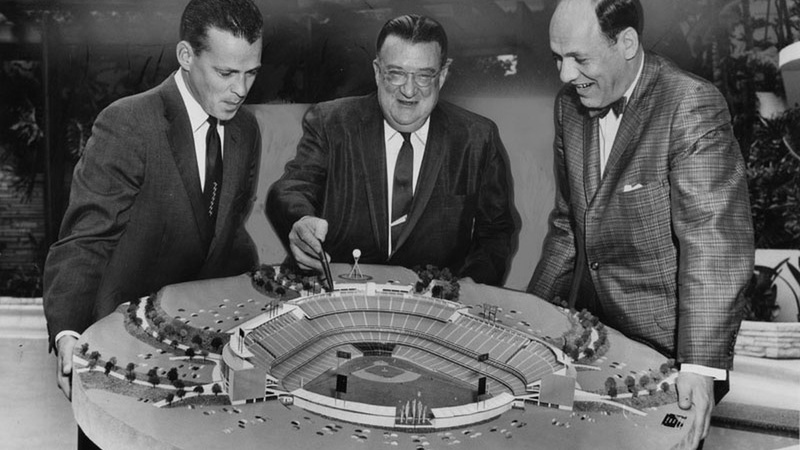 Walter O'Malley was a businessman who became owner of the Brooklyn Dodgers and he dreamed of having them play in a more modern, dazzling stadium than Ebbets Field which hew saw as a cramped, dirty stadium with poles that obstructed views and very little parking. But he wanted New York City to help him with access to cheap land, in a kind of public-private partnership. And they wouldn't. But LA was willing to give him the money and the land. According to Jerald Podair, author of "City of Dreams: Dodger Stadium and the Birth of Modern Los Angeles," Los Angeles at this time was very ambitious and wanted Dodger Stadium to be the first piece in the building of a modern world class downtown Los Angeles, that, in Podair's words, "would be in keeping and would be commensurate with the status and the power that the city was starting to amass - politically, economically, and especially culturally - after World War II." City powerbrokers didn't like the fact that LA's downtown emptied out each night as folks drove back to the suburbs. O'Malley chose to locate the stadium in Chavez Ravine. But there were some tensions about the choice of that site. A few years previously a longtime community of Mexican-Americans had been forced out through eminent domain to make way for a large public housing project. That project, designed by architect Richard Neutra, was never built -- because of the Red Scare of the time. When Walter O'Malley pinpointed the site a few years later, there were still some families holding out, having refused to leave their homes. But O'Malley was barely aware of this history. "One of the things that struck me in researching this book is how little O'Malley knew about Los Angeles in 1957. When he announced the move he had only been to Los Angeles three times in his life for a total of less than 10 days. He needed a map to get to Chavez Ravine," Podair said. Dodger Stadium is the third oldest MLB ballpark after Fenway Park in Boston and Wrigley Field in Chicago. But O'Malley wanted to add some innovative design features to his stadium, like sinking the stadium into the ground and arranging parking so you are basically parking on the level where your seat is. So fans are not climbing all the way up to the top from the bottom. And, of course, no poles and beautiful vistas of the mountains and the downtown area. And despite the stadium uprooting a Mexican-American community, the team's biggest fans are Latino. Latinos have stood by the Dodgers through thick and thin -- despite the brutal Chavez Ravine history. A listener reminded us that this is due to Fernandomania. Once Fernando Valenzuela was called up and helped lead them to an '81 World Series, the community caught on and never let go. Our stadium historian said that what O'Malley wanted most of all (besides winning more World Series) was a great Latino star. It is ironic that Fernando came along only a year and a half after O'Malley passed away.